Garlic butter can be used to make many things, such as garlic bread, garlic shrimp, or even used as a sauce for pasta. It’s also extremely easy to make. You can use basil and oregano, if you prefer a bit more flavor. Lemon juice is optional as well. The first thing you need to do when preparing garlic butter is let your butter soften. Just leave it out for a while. It’s probably best just to put it on the counter overnight. If you don’t have the time, you can just work it with a knife or a spoon until it becomes soft. Add finely minced garlic. 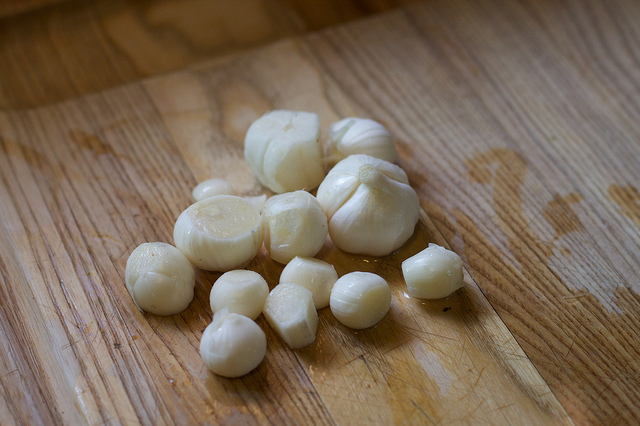 It is best to crush the garlic after mincing it as finely as possible, to ensure you get as much flavor as possible. Mix your garlic into the butter and stir thoroughly. Use a bunch of garlic if you really like it, and only a little if you only sort of like garlic. There is really no measurements required, here. And then either add a tablespoon of lemon juice or a teaspoon of basil and a teaspoon of oregano. Or you can get all crazy and add both. Regardless of what you decide to do, mix your garlic butter some more. To get a smoother consistency, it is okay to add a bit of olive oil. This is recommended if you’re using it as a sauce for your homemade pasta. Another way to get a smoother consistency: work your butter in a mortar and pestle or a food processor. Feel free to prepare a large quantity and put it in the fridge. It can be kept as long as butter.